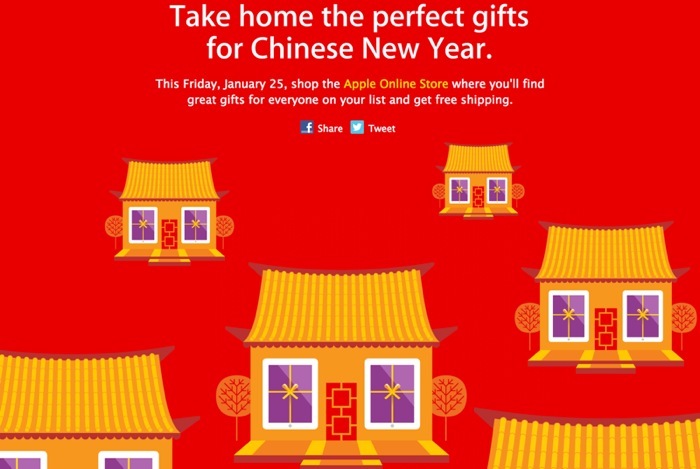 Apple's 'Red Friday' Lunar New Year Sale Will Bring Deals for Asian Customers on January 25 - iPhone.MY - Daily News On Mac, iPhone, iPads, iPods and more! Apple today announced its annual Lunar New Year sale, a one day event for Asian countries that is also known as “Red Friday” because of its similarity to November’s Black Friday sales. As with its Black Friday event, Apple will be offering limited time deals on Macs, iPads, iPods, and accessories like the Smart Cover. Last year’s sales saw discounts of up to 8% on iPads, 10% on iPod touches, and a flat discount of HK$ 770 on all models of the MacBook Air, the MacBook Pro, and the iMac. This year’s discounts are expected to be similar, and free shipping will be offered. Apple has also published a gift guide for the event, which features its flagship products like the iPad mini and the iPhone, alongside several third-party accessories from manufacturers like Bose, Logitech, and Griffin. The Red Friday sale will take place on January 25 and is valid in China, Hong Kong, Malaysia, Singapore, South Korea, Taiwan, and Thailand.